Let us help you find or custom create your dream gown! Please find details below in regards to our appointments, ordering and gown production. Our beautiful little space is located in a beautiful hide-away in Mudgeeraba on the Gold Coast. We look forward to welcoming all our clients to this beautiful retreat space! If you choose to order one of our collection pieces to size we are able to complete this within 5-6 months. Rush orders are available at an additional fee. To ensure every single detail is covered, Interstate brides must be able to physically attend 4-6 Fittings for a complete custom designed gown. However, where possible, 2 fittings could be held within a 3-5 day period. The initial design consult can be held via skype and fabric samples sent to you, however we do prefer in-person consults where possible. Our Collection gowns start at $1600 and we also have a wonderful new WHITE Collection featuring gowns under $1500. Our prices for Custom-Couture gowns start at around $2500 and go to around $6000+ inclusive of all fittings (up to 6 Fittings at our discretion) Our average bridal gown (custom-made) is around $3500.00 for a completely custom made gown. Our collection gowns are available to order Made-to-Size (6-16) at our RRP Pricing / OR / Made-to-Measure (including 2 Fittings) at an additional cost, depending on gown choice and structure. Once you have picked your dream wedding gown we take a 50% deposit to begin production. We also offer payment plan options to suit your budget. Once we receive your order we create a timeline including key dates and completion date. We will alert you when your gown is complete and available for pickup/delivery, Generally, 3-4 weeks prior to your wedding depending on time of order (rush orders available). Upon ordering your Collection Gown all of our beautiful Begitta Brides will receive a welcome package including access to our "Exclusive Client Log-In" Area via our website which holds essential lists, tips and tricks for all your wedding planning and inspiration! Our Exclusive Custom Couture gown process includes 2-6 Fittings (at our discretion) and initial basic Toile (Prototype) of your bodice shape to ensure the perfect fit. We aim to have your gown complete and available for pickup/delivery 3-4 weeks prior to your wedding (rush orders available) or can keep it safe and sound in the studio until a few days prior to your big day and schedule in a collection date. We can book you in with a date and time that suits you. Please let us know your preferred days and we will do our best to accommodate you as soon as possible. *As we do book out weekends quite early please be aware the wait time is generally 2-4 weeks for weekend appointments. Date, Time and Address will be forwarded to you upon confirmation and payment. Unlike large bridal boutiques our one-on-one consultations are an intimate process in our beautiful . As our space is quite petite we do recommend that you bring a maximum of 2-3 guests. We will do our best to accommodate additional guests but please do confirm your numbers with your booking. In this time you will have the opportunity to try on approximately 2-3 Gowns. You can get a feel for what we do and offer and chat to our stylist about your perfect style and what suits your body shape. Pricing on our collection gowns are available during your appointment and all additional details will be supplied via email post appointment. Our Begitta Luxe Concierge service offers you the chance to take your time, sip champagne and enjoy a personalised styling consultation with our head designer Begitta. Take the time to chat to Begitta whilst enjoy a glass of bubbles with up to 3 of your guests. We discuss your most loved styles and silhouettes, wedding theme, location and time of year and will tailor a selection of the perfect gown options to match. During this session you will have the opportunity to try on 3-5 gowns. This is a great opportunity to bring along your maids and see all the beautiful things we have to offer. Pricing on our collection gowns are available during your appointment and all additional details will be supplied via email post appointment. During your Custom Couture appointment you will have a one-on-one with our head designer Begitta. Over champagne and sweets, you will discuss your dream gown and all its beautiful elements. Begitta will hand-sketch your dream gown to your specifications and your gown will take shape in front of your eyes. We will take your measurements, peruse through our divine fabrics, exquisite French laces and discuss little details such as beadwork and hand applique. You will then be emailed a comprehensive Dossier (Portfolio) of your gown and the fabulous details of our fabulous process creating your exclusive one-of-a-kind wedding gown! Your email Dossier will arrive in your inbox within 7-14 days (additional time is required if we are sourcing specialty fabrics). Our Signature Luxury Gift Bags (Valued at over $150), which we gift exclusively to our Custom-Couture Brides upon securing their gown with us and paying their deposit. Including access to our "Exclusive Client Log-In" Area via our website which holds essential lists, tips and tricks for all your wedding planning and inspiration! 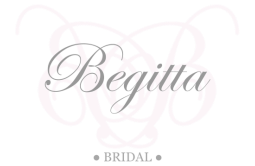 We are absolutely thrilled you have chosen Begitta to create your dream gown! If you have any additional questions please contact us HERE or email us at enquiries@begitta.com, if you would like to make a booking please send through your preferred days and times and we will get back to you with our availability for those days!